This Greek Pasta Salad with feta is perfect for lunches but also a perfect side dish for picnics and barbecues. When I made it for a bbq, there was none left! I’m going salad crazy lately. I eat a salad almost every day for lunch and I love to mix it up. And I’m not even really sure everyone would qualify this as a traditional salad, but hey, I say if its got veggies, it’s a salad. I made this salad for a BBQ we attended Memorial Day weekend. It was at Ben’s good friend’s house – he recently got married, and is expecting a baby! Lots to celebrate. His wife’s name is Rachel so clearly he chose well. And of course, I can’t show up empty handed. Well, I’m a mom, so I’m never really empty handed, but you know what I mean. I asked what I could bring but I was secretly hoping he would say a salad so I could create this pasta salad that I’ve been dreaming up in my mind. And he said a salad sounded perfect – hooray! 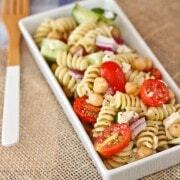 This Greek pasta salad with feta is a spin off my Greek Chopped Salad, another favorite of mine. Both of these salads would benefit from olives too – I’m just personally not a fan. 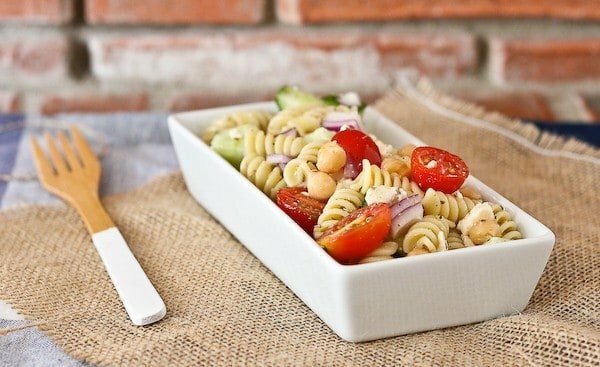 I used the same dressing for this pasta salad as I use for the chopped salad. It’s really simple – red wine vinegar, olive oil (use good stuff!) and lots of oregano. 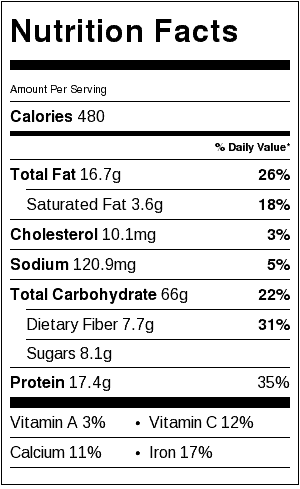 Of course you’ll also add salt and pepper to taste, keeping in mind that feta adds some salt as well. 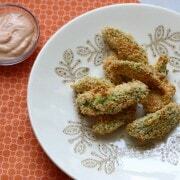 I added garbanzo beans (aka chickpeas) for some added protein and a chewy textural element. If I was making this for myself and not for a picnic crowd, I’d likely use whole wheat pasta – that’s the go-to in our house. 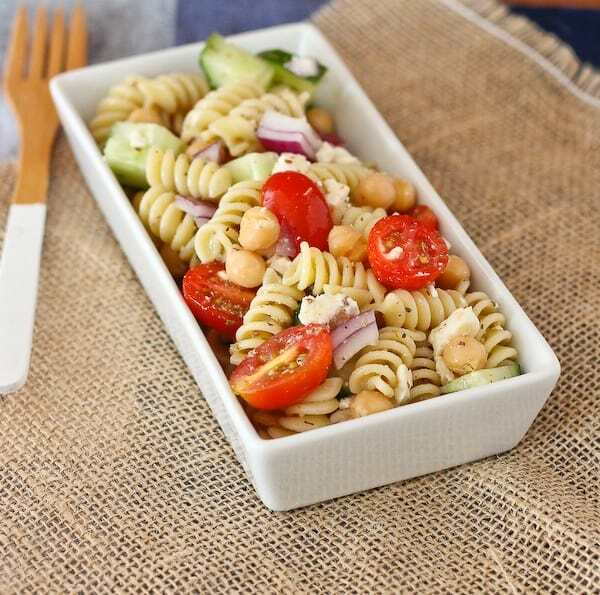 Another great thing about this greek pasta salad with feta is that it isn’t mayo-based so you don’t have to worry quite as much about it spoiling if it gets closer to room temperature. And that’s always a plus at picnics. 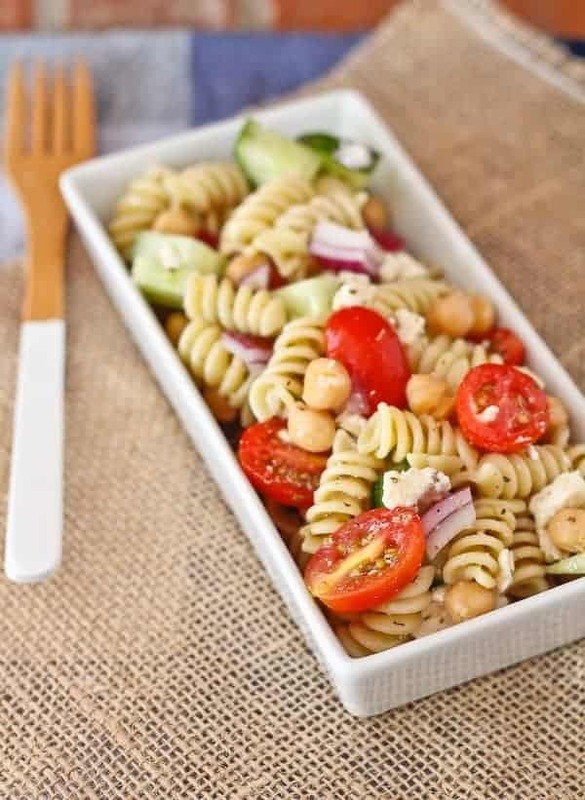 In a large bowl, add cooled pasta, red onion (see note), cucumber, tomatoes, feta, and beans. In a small jar, add vinegar, olive oil, oregano and salt and pepper. Cover and shake until combined. Pour dressing over salad and stir until everything is well combined. Keep in fridge until ready to serve, up to a day. Stir again just prior to serving. Note: After I cut my onion, I soak it in ice water for at least 10 minutes. This takes away the bite and makes it much more mild. Verdict: LOVED this. Definitely will make it again. Husband’s take: You know, I’m not even sure he’s tried this. He loves my Greek chopped salad, so I’m sure he’d like this too. All I know is that the bowl was completely empty at the party. That’s always a good sign. Craving more pasta salads? 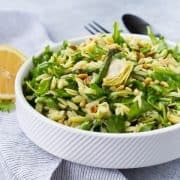 I’ve got you covered: Orzo Salad Recipe with Yogurt Dill Dressing, Herbed Israeli Couscous Salad with Tomatoes and Mozzarella, Summer Pasta Salad (this one is an oldie! ), Asparagus and Arugula Pasta Salad from Gimme Some Oven, or Mediterranean Pasta Salad from Table for Two. 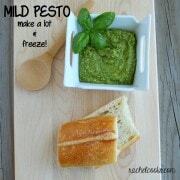 And of course, you can always check out my salad Pinterest board for more inspiration! I make a really similar Greek salad, but without the chickpeas. LOVE that addition. You win.